Occidental College has a very interesting and unusual Book of Hours, one of whose features is a unique(?) image of its patron saying the rosary. I provide a fairly detailed textual and iconographic descriptions below, but first the known details of its provenance. Leaves of a fine copy of the Communiloquium or Summa Collationum of John of Wales (alias John Waleys / Joahnnes G[u]allensis) are to be found in a wide variety of collections, and they occasionally appear on the market. One framed leaf, at Occidental College, provides information about their provenance, otherwise unavailable. The small collection of medieval leaves in Special Collections in the Library at Occidental College in the Eagle Rock area of Los Angeles has yet more interesting items to offer. Among them is a leaf from a Psalter with Passion Sequences, written by the humanistic scribe Pietro Ursuleo of Capua (d.1483). 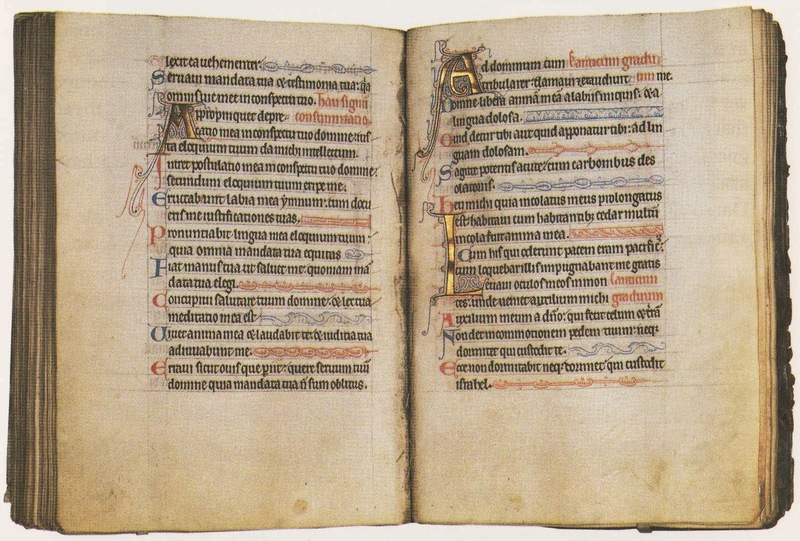 The fact that the Psalm 21 initial is enlarged (three lines in height, instead of Psalm 20's two-line height) suggests a Benedictine connection: Psalm 21 was one of the Benedictine divisions of the Psalms, being the first Psalm said at Matins on Sundays. The Maggs description reports that it was previously Christie's, 2 July 1975, lot 290, when it had "140 leaves (including one replacement leaf at the beginning)". I have just noticed that the volume was sold at Sotheby's, 23 June 1998, lot 45, with a description listing several single leaves that had been extracted since 1975.